It was Friday evening and Daisy, Desi, and I were in Astoria at Desi’s favorite restaurant, Arepas Cafe, after having participated in a march against white supremacist violence and justice for Timothy Caughman. Daisy had just received word that Desi’s play date for the next day was cancelled because Desi’s friend had the flu. We had no other real plans for the weekend other than the usual household chores so I suggested, half-seriously (and not expecting anything but a stern “No!”) that we drive up to the Adirondacks so I could finally connect with a Great Gray Owl. Daisy, to my amazement, took the suggestion seriously and asked about how long the drive was and where we would stay for the night. With much trepidation I told her the owl was in Keene, about four-and-a-half hours away and I could call my folks and see if they would put us up for the night at their house, half-way back from the long-range twitch. Desi was game and that convinced Daisy. 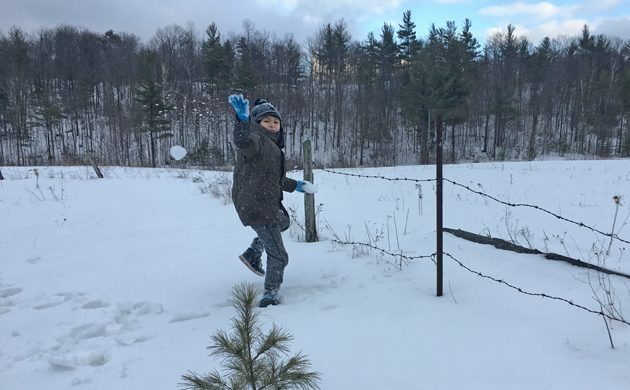 After all, exposing a child to nature is important in their development, right? Anyway, Saturday morning came and we took our time getting out of Queens. After all, the Great Gray Owl in Keene was seen mostly in the evening and we had all day to get up north. Nonetheless, once I was behind the wheel and on the open highway I put my lead foot to good use and we made good time as made our way through the Bronx, Westchester County, Rockland County, Orange County – where we started run into rain – Ulster County, Greene County, Albany County – where the rain started to turn into snow – Saratoga County – where we stopped for twenty minutes to pick up some lunch – Warren County – where the precipitation came to an end – and, finally, Essex County. Desi, well stocked with library books and his tablet, was remarkably well behaved on the five hour drive. We were all relieved at four in the afternoon when we finally pulled up on the side of Lime Kilm Road (yes, “kilm,” and no, I don’t understand why it’s not “kiln”) where birders were congregated. 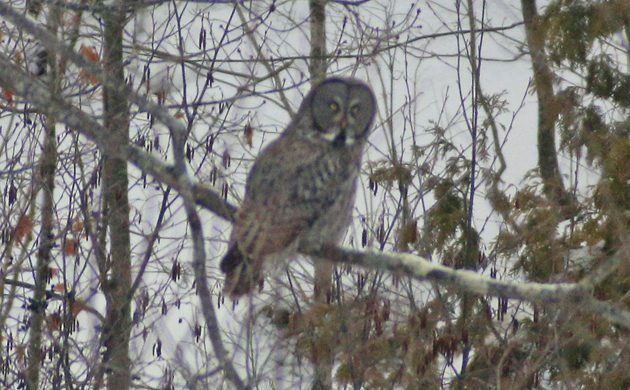 I was not happy to learn that after spending most of the afternoon flying from perch to perch and actively hunting the owl had disappeared into some evergreens twenty minutes earlier. (Why did we stop for lunch!?!?!) It was not in sight and most of the congregated birders, having already had a great show, were leaving. Some, who hadn’t had enough or who were particularly into standing out in the cold, decided to keep vigil. It was a long two-plus hours. I saw a beaver though! That was nice. 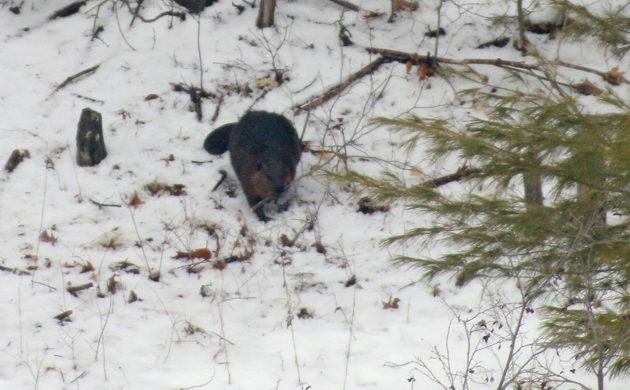 The beaver was way over on the other side of the valley we were looking down at. It went up the slope, found a branch, and dragged it back down the slope. It was something to look at but about as exciting as writing this description was. Especially considering that this was about forty-five minutes into the Great Gray Owl vigil. Other than the beaver there wasn’t much to see. A couple of Red-winged Blackbirds, some Common Ravens, a flyover Pileated Woodpecker. I’m not truncating the list: those are the only species that I saw while I waited. That said, the windless day reminded me of how quiet the north woods can be in winter. Sound carried forever so I did manage to add several common species to my day list by ear only. Then, shortly after six, the cry went up. Someone (a guy named Rick?) spotted the owl. 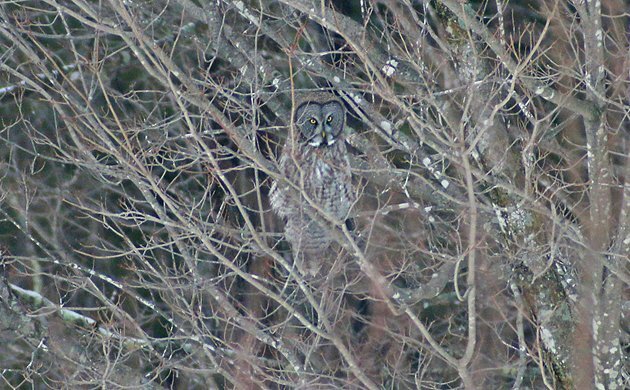 I ran down the road to where it was seen from and, sure enough, Great Gray Owl! The first shot of the bird I got. Out-of-focus, distant, and lousy. But it’s a GREAT GRAY OWL! I drank the bird in, looking through my Swarovski scope with the zoom up high. The bird was every superlative in the book plus some I invented on the spot. It was stunning. Also stunning was the fact that I had completely forgotten to tell Daisy and Desi that the owl I had dragged them over two hundred miles to see had deigned to make an appearance. Oops. I jogged back to the car, let them know, and brought them back to the scope where they both ooed and aahed. After the fact Desi tried to play cool by saying that the owl was “boring” but in the moment he was pretty excited, even insisting on a last look before we left so he could say bye to the bird. We spent a good forty minutes or so with the owl, watching it change perches a couple of times, before realizing that if we wanted to get to my parents’ house at anything approaching a decent hour we had to get going. I would have loved to spend more time but we needed to hit the road. But, heck, we saw a Great Gray Owl! The best shot I got of this amazing owl. A celebratory stop at Stewart’s for snacks and coffee was definitely a necessity before we made the nearly three-hour drive to Saugerties. Would we do it again? Daisy and Desi may or may not agree but I definitely would! Family twitching? It can work if you try! That’s a pretty epic owl. Congrats. Love those GGOs, total totem in my family of birders (my dad’s totem, tho he may claim a raven instead!). I have never seen one and love that you took a spontaneous trek with your family. And yeh who cares if that first shot was out of focus–it’s GGO for heck’s sake! Lucky you. Here’s to last minute overnight twitches. Hooray for Daisy and Desi! And, so happy you got to see one of our NYS Great Grays.